Dominical and the surrounding areas have some really great places to eat from beachfront casual to fine dining (still casually dressed). There are restaurants for the entire family with kids favorites like pizza, burgers, and tacos to options for international cuisine by chefs from all over the world. Café Delicious – The café bakery in the front of Dominical. They have incredible pastries, cappuccinos, and other coffee drinks or smoothies for breakfast. And a great place for lunch where you can pick up a sandwich, lasagna, and more. Free WiFi and not open for dinner. Rio Lindo – Next to Delicious and they have tasty New York style pizzas, which is good for takeout or enjoy the bar and atmosphere for Monday Night Football. They also have wings and traditional American favorites, plus a pool table. The hotel sometimes does a poolside sunset BBQ on weekends, ask about it while you are here. San Clemente – Located in Dominical just after the Dominical futball field on the left. VW bus in the air means you can’t miss it. This is typical American Tex-Mex tourist food, but a fun place for kids with tons of broken surf boards hanging from the ceiling, TVs, and ping pong table. Tortilla Flats – Great for breakfast, lunch, or dinner. 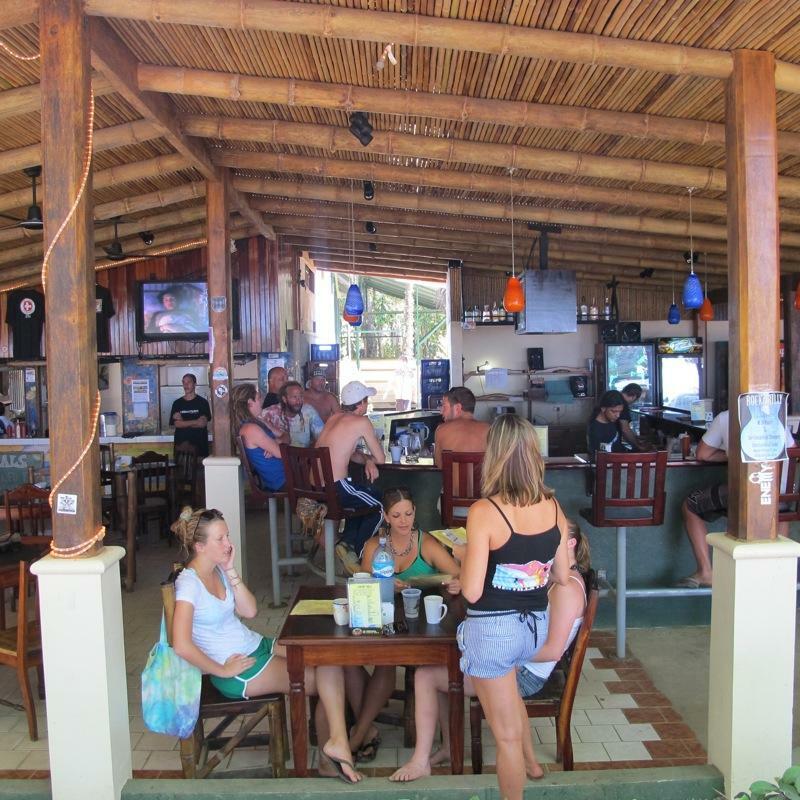 Located right on the beach, it is the local hang out and they have a happy hour sunset specials. The bacon, egg, avocado, tomato, and cheese sandwich for breakfast and Coconut encrusted Mahi for dinner are my best suggestions. Sometimes they have specials written on a chalkboard for dinner and those are always a good choice too. Free WiFi internet access. La Casita Pizza – This is the best pizza in town in my opinion and owned by a couple guys from Argentina. Located out of a house or “Casita” on the road that loops around behind Tortilla Flats, there are signs around town to help you find it. They offer daily lunch specials of a slice or two of pizza with a drink, have free WiFi for guests eating in, and are pretty quick for takeout pizzas, plus deliver by motor cycle if your place is close. Sushi – The only sushi place in town or this area for that matter. It located straight past the cell tower, after the police station, and on the left across from El Coco. It is a small place, but the freshest ingredients from land and sea make for delicious sushi. Fresh tuna rolls with avocado and mango, amazing combo!! Small restaurant without much seating, so get there early. El Coco – Across from the Sushi place and also right on the beach. They serve big portions of typical local food at decent prices. Bar and pool table, plus plenty of seating. Confusione Tapa Restaurant – Go past the Sushi place and El Coco and then turn left just before the Refuge and Pyramis 2 story open building on left. A tranquil ambiance and wonderful Italian food and mini pizzas. They have a very extensive Tapas menu now and choosing just a few items is the toughest part. The Refuge – This casual restaurant has the best burgers in town and is at the end of the road past El Coco and on the corner of the turn off for Confusione. Also on the corner next to the beach if you go into Dominical by the back entrance which goes straight to the beach just South of the Pacific Plaza Commercial Center from the Coastal Highway. Best to go for lunch because they close early daily and are closed on Sundays. 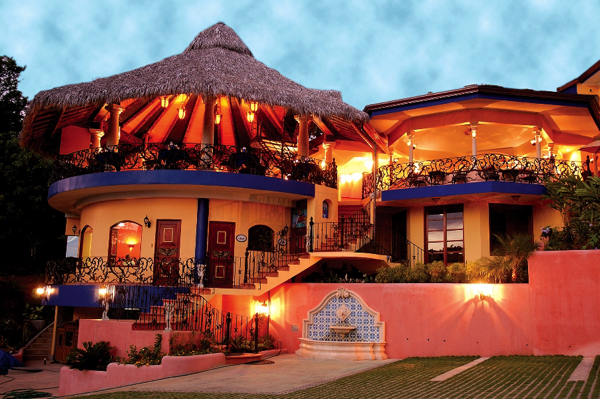 La Parcela – A must-do dining experience located on Punta Domincial with the Pacific Ocean on both sides. Turn right off of the Coastal Highway after the straight away that is after the Playa Dominicalito turn off with futball field on the left and it is marked with a “La Parcela” sign for the restaurant. Their fresh tuna steak, snapper, and other seafood dishes are all delicious. They also offer various pastas, steak, and chicken. Save room for dessert and try the Banana Flambé for a fire show or the Mud Pie if you’re a coffee lover. Cuna del Angel – Located about 10 minutes south of Dominical, look for blue sign indicating the right hand turn off for Cuna del Angel Hotel. This is one of my favorite places to eat and they have an enchanting atmosphere at the Hotel and Palapa Restaurant. Besides the gourmet food, they also have a day spa for massages, facials, and other relaxation treatments. Also offer Sport Fishing tours and will prepare any fish caught at the restaurant the same night. Jolly Roger’s – This is the best place for wings in the Southern Zone with about 20 different flavors, plus they got great burgers too. Located up the mountain in Escalares and the left hand turn entrance is just before Cuna del Angel and is marked with a sign. Drive up about 4 to 5 minutes on dirt roads and it will be on your left. Only open after 4pm (if they even feel like opening) and very casual. Good place to watch football or have some cold beers as well. 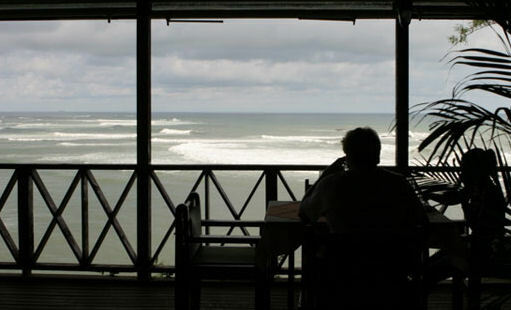 Citrus – This great fine dining restaurant is in Ojochal 35 minutes South of Dominical. Take left into main entrance of Ojochal and then an immediate left. After 50-100 meters or so you pass the police station on your left the restaurant entrance will be on your right. They have French-Canadian and International cuisine with plenty of options for sea food and steaks. I like the Corvina (Sea Bass) with a dill cream sauce and my wife always gets the steak with mushroom sauce. 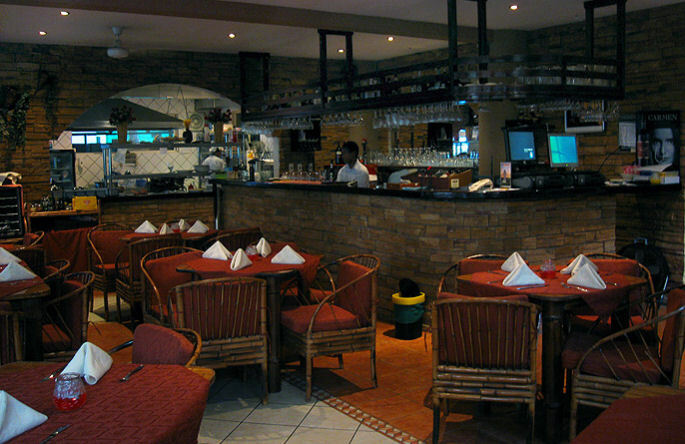 Café Exotica – Also located in Ojochal about 35 to 40 minutes South of Dominical and is many people’s favorite restaurant. To get there, turn left off the Coastal Highway at the Ojochal main entrance and go straight over the first bridge then left on other side of the bridge. Then go straight for 2 or 3 more kms and it will be a small place on your right. They have some of the best steaks available, sea food entrees are amazing, and numerous delicious appetizers. French-Canadian cuisine as well. I hope you enjoy some of these restaurant suggestions while visiting or living in the Dominical area. Writing this blog definitely made me hungry and I will be taking my wife and kids out for dinner tonight!! This entry was posted in Costa Rica Vacations, Costa Rican Food, Dominical Costa Rica, Living in Costa Rica and tagged Costa Rica, Costa Rica food, Dominical restaurants, Places to eat in Dominical by dominicalproperty. Bookmark the permalink.